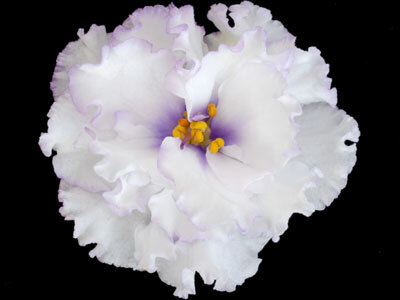 Double pansies of white with a heavily fringed edge. Blue outlines the outermost petals, with green occasionally on the upper petals. AVSA Reg. #10749 - Very vigorous plant and on sale here at our top rated and affordable online plant and flower nursery at the best possible cheap discount online sales price.